WASHINGTON, Jan. 29 /CSRwire/ - Field to Market: The Alliance for Sustainable Agriculture announced today the launch of a new three-year strategic plan. 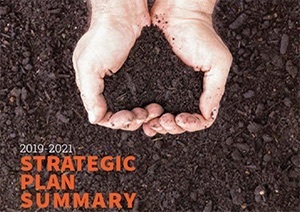 The 2019-2021 Strategic Plan builds on more than a decade of Field to Market’s role as the leading multi-stakeholder organization committed to defining, measuring and advancing sustainability in commodity crop production in the United States. The food and agriculture industry faces increasingly complex challenges to produce food, feed, fiber and fuel for a growing and more affluent global population, while conserving our natural resource base and adapting to a changing climate. A major premise of the new plan involves leveraging the collective influence of Field to Market’s diverse membership to meet this challenge and drive continuous improvement in environmental outcomes. Convene Diverse Stakeholders to facilitate multi-sector collaboration, advance shared learning, and drive collective action. Provide Science-Based Leadership to develop and strengthen resources for measuring sustainability performance and assessing opportunities for improvement. Scale Impact Through Partnerships by developing a flexible program framework, facilitating partnerships, and leveraging capacity to support farmers in delivering improved environmental outcomes at the field and landscape levels. Enable Credible Communications that facilitate and improve supply chain and industry reporting, showcase leaders in sustainability, and strengthen public confidence in the food and agriculture system. On January 30, Field to Market will welcome new members to its Board of Directors, comprised of three representatives from each of the five membership sectors of Field to Market: Affiliate, Agribusiness, Brands & Retail, Civil Society and Growers. At this first meeting of 2019, the Board will be charged with overseeing the implementation of the new strategic plan. Zhu, Reed, and Franz were each re-elected to a second three-year term on Field to Market’s board, while Bubniak and Herndon are newly elected members. Isbell was elected to fill a vacancy, and Sirolli and Hunnicutt will serve as new representatives for their respective organizations. To learn more about our Board of Directors, please visit https://fieldtomarket.org/the-alliance/governance/board-of-directors/.